Actigram is a personal assistant for health and chronic conditions. It uniquely reaches out at the right time and motivates to make a change using personalized actions. This was created during the Human API hackathon. Brandon has been getting irregular sleep. Actigram notices that he's been getting less than 5 hours of sleep for the past two nights and surfaces this. Actigram provides some tips on how to get better sleep and suggests to set an alarm an hour and a half before bedtime. Actigram knows Brandon's BMI has gone up last week. 30 minutes before lunch, it recommends healthy lunch options near his office. 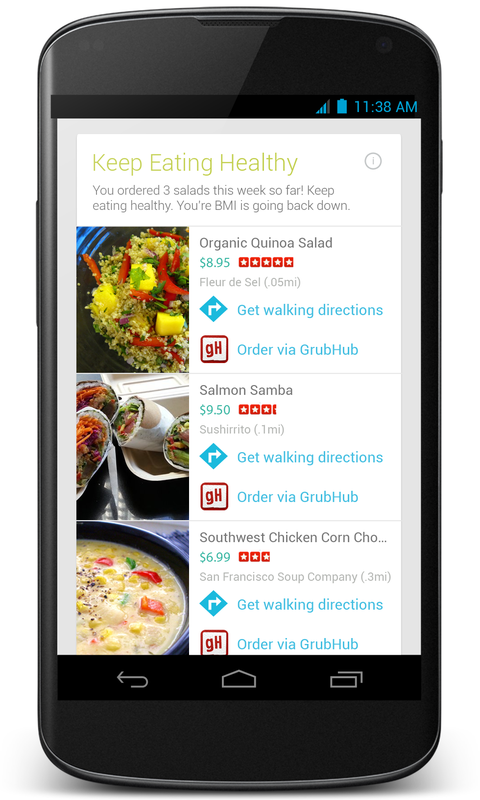 It suggests walking directions and provides an option to order now via GrubHub. Actigram notices that Brandon’s hearth rate and blood pressure has elevated this week, even in times of sedentary activity. Brandon is under considerable stress this month. Actigram suggests that Brandon chat with his loved ones to relax and provides the option to book an appointment with his doctor via through One Medical application.